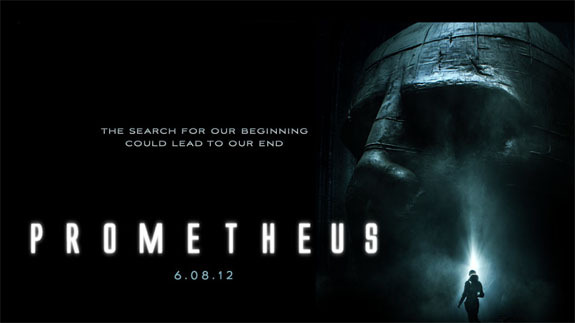 The Billionty-Oneth Geek: "PROMETHEUS... are you seeing this?" "PROMETHEUS... are you seeing this?" After several decades spent away from the genre, Ridley Scott makes his triumphant return to sci-fi with the much anticipated Prometheus. Though the marketing approach sought to create a connection with Scott’s original Alien, the actual connections are few. Although it takes place within the same universe, the direction of the movie is totally elsewhere. In Prometheus, we follow Holloway and Shaw, two archaeologists on Earth who discover ancient cave drawings around the world. Normally, there would be nothing to it, but they find strong similarities between the drawings despite being oceans apart. They interpret these drawings not just as pictures, but rather as a map to our supposed creator or creators. With this in mind, they, along with a crew from the Weyland Corporation, embark on a journey galaxies away, following this map to our supposed creators. They are led to a moon called LV-226 (not to be confused with the more familiar and xenomorphic LV-426), where they quickly discover strange dwellings, once inhabited by titanic beings. Being on alien planet, it’s not long before our heroes and friends become prey to some unimaginable force. But through this adventure, some big questions are raised... will they be answered? Prometheus is quite an ambitious project. Aside from the Dark Knight Rises, it is probably the movie with the most intrigue built around it, with a story shrouded in secrecy, before its release this year. It is not a perfect movie, but it is a perfectly good movie. Ridley Scott uses science fiction to captivate an audience – something I haven’t felt in years. When thinking about this movie, tonally, it seems like something in between the original Alien and James Cameron’s Aliens. It is not a teeth-grinding, suspenseful horror film like Alien and it isn’t an action-packed rompfest like Aliens. It is something with a lot thought and something methodical. But that’s not to say that it too, isn’t a gripping movie. There are some scenes that are filled to the brim with tension and terror. However, those moments don’t define the overall direction of the whole piece. The movie itself is akin to a journey, with a strong focus on exploration and discovery. It is in a way scientific, and as such, it poses questions. Science is in itself an exploration of a question. Though answers are sought for, they are not always delivered. Prometheus follows the same path. Questions are raised, but not many of them are answered. What this creates is an open forum and a discussion of ideas and philosophies (check out the Reddit discussion here). It is possible that the whole movie may have just been a preface into something larger. Much like with Ridley Scott’s original Alien, perhaps he was paving the way for another. There’s a good part of me that hopes that this isn’t true, and that this would be it. No franchising or sequels. Not because it’s bad and that I don’t want to see more. But I like the open endedness of the story. It’s something you don’t usually find nowadays, ESPECIALLY with mainstream Hollywood, big-budget releases. There’s a lack of boldness in film these days, and I feel Prometheus works to bring some of that back. Til next time, later geeks.